I’m here to say, the retractable lead is a terrible idea and it is more dangerous than safe for use with your dog. Number one reason it is dangerous? It can cause severe injuries to people and dogs. Don’t believe me? Simply google “retractable leashes” and view the images of injuries. Warning, some of them are pretty graphic. The problem is, that once the lead is extended to full length, you can’t pull your dog back in. Not fast enough and not without causing some injury to your fingers and hands. If you’re not familiar to what happens with a retractable lead once it is extended, it becomes a very thin lead, even thinner than a shoe lace. You can imagine, that unless you wear gloves when walking your dog all the time, you can’t get a safe and proper grip of the lead. Not to mention, that thin of a lead can disappear from sight. People may not realize your dog is on a lead. If your dog is aggressive at all, whether it be towards people or other dogs, you have no business putting your dog on a retractable lead. None. Having your dog on a retractable lead and allowing it the “freedom” to be far separated from you is quite frankly extremely irresponsible of you. You are putting other people and dogs at risk. An aggressive dog should be under your control at all times. You should have it by your side, so that should a situation arise, you can handle it quickly and calmly. An aggressive dog at an extended and thin lead of a retractable leash is that much more dangerous than the dog alone. Imagine not being able to pull your dog back to you. Imagine your aggressive dog circling and ensnaring another human or dog with that extended lead, escalating the problem at a rapid pace. It horrifies me just thinking about the injuries that could have been prevented. If you have children, please do not use a retractable lead with them or allow them to walk a dog on a retractable lead. Again, you are just asking for injuries. Your dog may be the sweetest thing ever with children, but that lead is dangerous on its own. When a child walks a dog, the dog should be with the child and not far ahead of the child. A shorter lead allows for more control and a child walking a dog that is way ahead of him/her is likely to lose control of the dog or fall down when the dog suddenly gets excited about something and tries to run off. Now imagine a dog running off on a retractable lead, or circling back and wrapping your child’s limbs. This kind of injury can easily happen even if you, the parent, are holding the lead. If you have more than one dog, please oh please don’t use a retractable lead. Especially if you are walking all of them yourself and it should be said that any dog that doesn’t understand how to walk on a lead and has no lead etiquette, should not be on a retractable leash. The retractable lead is asking for trouble. There are far too many injuries that can occur. I understand the desire to give your dog more freedom, but chances are, you aren’t being very responsible with that lead. Do I use a retractable lead? Yes. Am I a hypocrite? That’s your opinion. But I am also not Jane Average Dog Walker either. I am educated and experienced in working with animals. My dog and I have been together for 5 years. She and I are perfectly in tune with each other. When I walk her, I am always focused on her and my surroundings. I pick up on her body language and moods. I observe and respond to potential problems. When other dogs and people approach, she doesn’t have a fully extended lead. When we walk along the street or in crowds, again, she is by my side. Her extended lead is for walking in safe areas, like the farm fields near my home. I am also quite fortunate though, in that my dog is allowed to be off lead. So when it is safe, like in the forest or in the farm fields, I can take my dog off her lead. At night, because I can not see my surroundings well and far into the distance, I always leave my dog on a lead. Too many cats and other nocturnal creatures are out during my evening walks. I also have no children, so there is no risk of injury there. For the record, if I ever do walk my dog with a child, it would not be a retractable lead. It is my opinion, that most people aren’t aware enough to be able to use a retractable lead with their dog. If your dog is aggressive, if you are with children, or if your dog has absolutely no leash etiquette, you should not be using a retractable lead. It’s just irresponsible and a ticking time bomb of problems. For other people, like myself, the retractable lead doesn’t have to be such a dangerous tool. 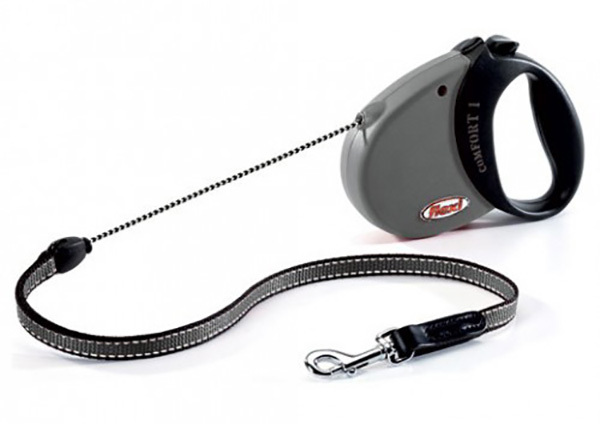 I think the retractable lead needs to be treated like a serious tool, instead of some flippant “leash of freedom”. Like most things in life, having the right attitude, education, expertise, and respect make all the difference. I don’t think this particular tool should be used by most dog owners, but I think those who educate themselves and have a tight bond with their dogs, can use this lead safely. This entry was posted in animal care, dogs, opinion, retractable lead and tagged dog walking, dogs, opinion, retractable lead by Sylvie Charment. Bookmark the permalink. True. My dog is very wary about other dogs. She’s not aggressive, but she’s not very social. How can she be when 50% of the dogs want to rip her head off? The little ones aren’t so bad, just yapping and growling, but the other day, some jerk had his big dog off leash and he came charging at mine!